The rare Florida panthers soon seemed to go extinct. In a last minute effort Texas cougars were allowed to breed with the Florida Panthers; and the result is a hybrid and stronger breed of the panthers, that according to one scientist, should be dubbed as the Arnold Schwarzeneggers of cougars. The Florida panthers are a subspecies of the cougar, or the big cats that are found in the region that lie across America. These cats are called pumas or even mountain lions, based on the region that they’re found in. In the early 1900s, the people ended up hunting the Florida panther out of their natural habitat in the U.S. range. The animals fled to the rugged swamps of South Florida. The inbreeding amongst the few that were left ended up leading to a lot of genetic defects, and a lot of them began dying. As a last-ditch effort to try and salvage the situation, the U.S. government decided to release eight of the Texan female cougars into Florida. Believe it or not, this strategy worked. 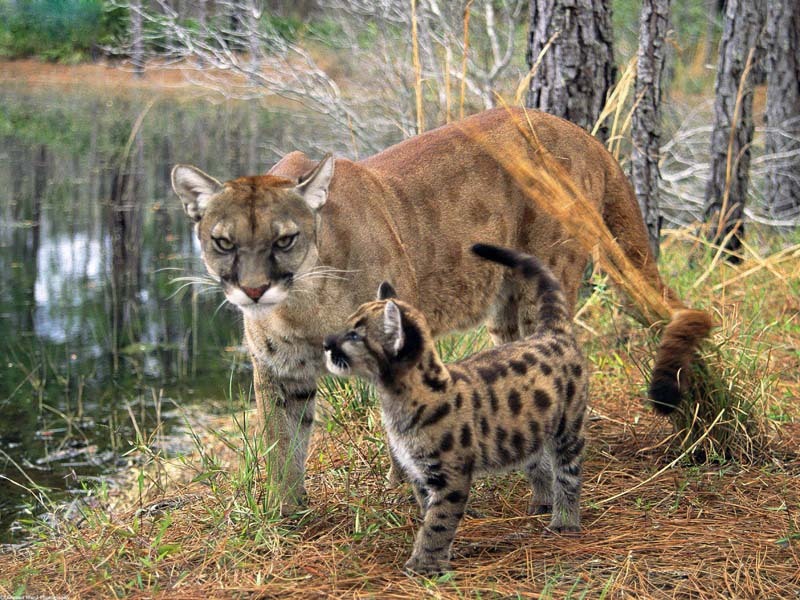 The cougar infusion caused for a subsequent increase in the number of panthers and about 100 of them began roaming the region of Florida. In tandem with that was the fact that the offspring produced were said to be very different genetically and they were seen to live longer and stronger. The difference in the fitness levels of the animal also made a difference. If being cornered by a scientist, the Florida panthers would climb a tree and cower there. The rare hybrid, on the other hand, would jump over the scientists’ head and scamper away to safety. In a sense, it could be said that the release of the female cougars into the region helped in restoring the genetic flow that had been interrupted by humans. Florida panthers are considered a subspecies of cougar, big cats found across the Americas that are also called pumas or mountain lions, depending on the region. Inbreeding within this tiny population caused heart problems and reproductive defects that would have killed off the Florida panther—deemed endangered by the U.S. Fish and Wildlife Service—by the early 21st century.